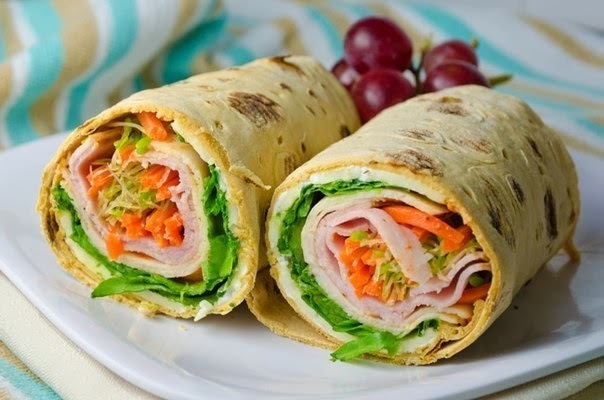 Appetizer in the form of rolls and rolls of bread come to our menu not so long ago. It should be noted that this dish had our host's liking for its taste, beauty and ease of cooking. For the preparation of rolls you will need three or four sheets of thin pita. On the table spread out a kitchen towel first, it stretches a food film, and the film is laid out the first sheet of lavash. The sheet of lavash is often first lubricated soft cream cheese, then laid out the stuffing, she was smeared with mayonnaise or dressing, and in the end served another pita. All of this rolled into a roll. The roll must be wrapped in plastic wrap for 2 - 3 hours place in the refrigerator for impregnation. The filling of cheeses: cream cheese, any hard cheese, boiled eggs, garlic, mayonnaise. The stuffed bell pepper and tomato: butter, feta cheese, paprika, tomatoes, parsley, walnuts, garlic. Stuffed salmon: salmon, dill, green onions, cheese, sausage, mayonnaise. Stuffing with crab sticks marinated mushrooms, crab sticks, cream cheese, herbs, garlic, mayonnaise. Some hostess on a greased cheese and mayonnaise pita bread spread salad leaves. The choice of toppings is a matter of taste. Forward experiments await!